Hard wearing leather tool belt - adjusts to fit. Leather belt for dangling your tool holsters from. Free size, 130cm long - the buckle comes off so you can cut the end to length (see the video for a demo). 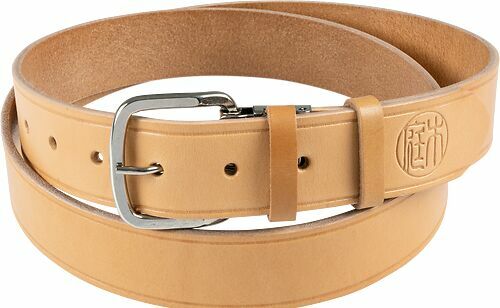 Wear it as a regular belt, or outside, gunslinger-style. It starts off pale but soon develops a nice leathery patina. Cut to fit - measure twice, cut once. Niwaki Tip: Measure twice, cut once!